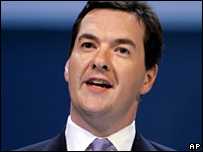 The Conservatives are planning a carbon tax on British businesses, shadow chancellor George Osborne has said. This would raise more money than the existing climate change levy, he told the CBI conference, and would be "offset" by tax cuts elsewhere. "We want to shift the tax burden away from income and investment and onto pollution," Mr Osborne said. Money currently raised by the levy subsidises energy-saving investments and national insurance reductions. Mr Osborne said: "The chancellor decided to increase National Insurance and at the same time reduce the proportion of taxes collected by green taxes. "We want to go in the opposite direction." The Conservatives' tax proposal is called the "carbon levy". Mr Osborne told business leaders: "I would like your thoughts and input into the exact design of the carbon levy - but let me stress, any additional revenues that it raises will be offset by reductions in other business taxes. That is a guarantee." The climate change levy was introduced in April 2001 to cut emissions from business. Companies can often recoup the money through the energy they save and can also avoid payments by using renewable - but not nuclear - energy. BBC economics editor Evan Davis said the climate change levy raised less than £1bn per year, and that the carbon levy was the first substantive proposal by the Conservatives for a new environmental tax. There were no plans by the Tories to tax households directly on their carbon emissions, he added. The Conservatives have said they want green taxes to form a higher proportion of all taxes, although they do not want the overall tax take to rise. Mr Osborne told the CBI conference in London that his party was not becoming "anti-business". "For too long my party abandoned issues like the environment, flexible working, and social responsibility to our opponents on the left. "So I make absolutely no apology that we have been talking about the new business agenda." Mr Osborne also warned against misunderstanding globalisation, saying: "I think there are quite a lot of lazy assumptions out there that we need to confront. "There's the assumption that we'll do the clever stuff, we'll move up the value chain, and leave the Chinese and Indians to do cheap things. "Let me tell you - no one has told them that." How green are the Tory blues?